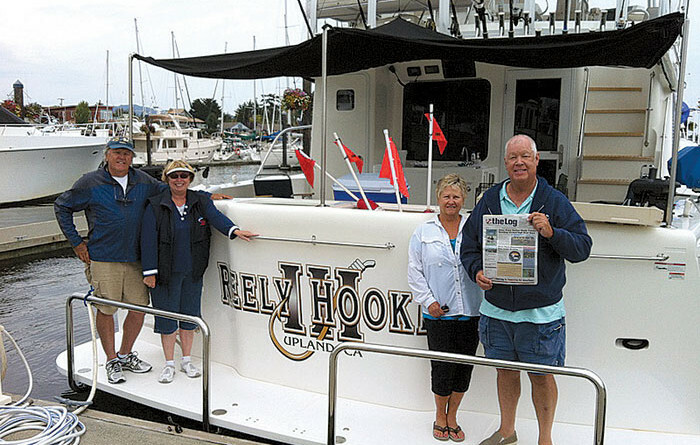 Port Sidney Marina, British Columbia, Canada — Jon and Connie Bivens (left) with guests John and Karen Willis are pictured getting ready to cruise on Jons 57 Mikelson Reely Hooked III to the Gulf Islands of British Columbia. This is the friends third season of cruising this region. Several Dungeness crabs were caught just outside the marina for dinner later in the week, Karen reported. Of course, we brought along The Log, to keep us updated on SoCal boating news.